The Tinker’s Butterflyfish (C. tinkeri) is a member of the marine butterflyfish genus Chaetodon (family Chaetodontidae) and one of five species in the subgenus Roaps. It isnamed for Spencer W. Tinker who discovered it in Hawaii back in 1949. Also commonly called the Hawaiian Butterflyfish, C. tinkeri has quite a limited distribution in the wild; inhabiting only Hawaii, Johnston Atoll and the Marshall Islands in the tropical Pacific Ocean. It is a deepwater dweller, being found at depths of 27–160 m (~90–525 ft), and typically in excess of 40m (~130 ft). The great depths where it lives make the Hawaiian Butterflyfish difficult to collect which contributes to the higher price it commands. 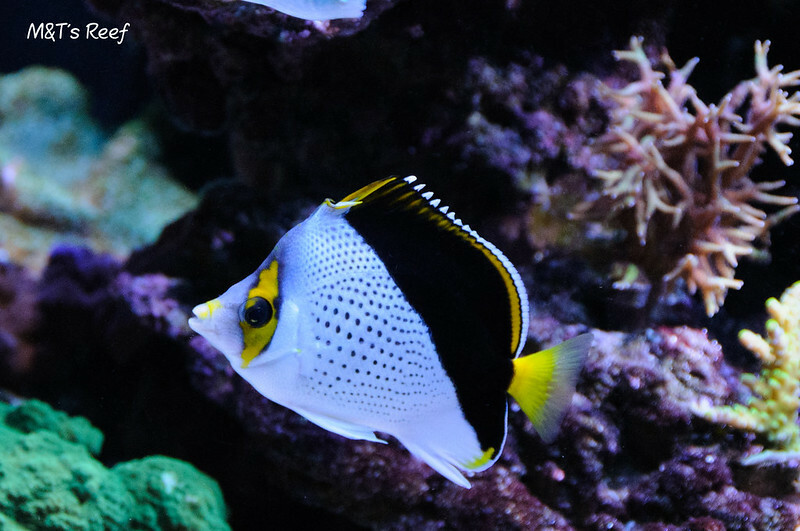 As with all butterflyfish in the Roaps subgenus, the Tinker’s boasts a striking color palette of white, black and gold; the anterior portion of the body is silver-white peppered with black spots, while the posterior is black divided on a diagonal. It possesses gold bands across its eyes and dorsal fin and a lovely golden caudal fin. This wonderful fish also sports a bold personality to match its striking coloration. C. tinkeri frequently swim out in the open and demonstrate lively and playful interaction with tank mates. They are not overly-aggressive however, being quite compatible with most commonly-stocked aquarium fishes. As with most species, they will display aggression towards conspecifics, so the aquarist should be cautious about introducing C. tinkeri with other Butterflyfishes, especially in smaller tanks. In the wild, Tinker’s Butterflyfish inhabit steep slopes in very deep water, and typically are seen as solitary specimens, or in pairs (when mating), and occasionally in small groups. Since these fish are active swimmers, a minimum of 75g (285 liters) tank is recommended. Being a deepwater species, C. tinkeri is not overly selective about what it eats in its natural habitat (planktonic and benthic organisms). 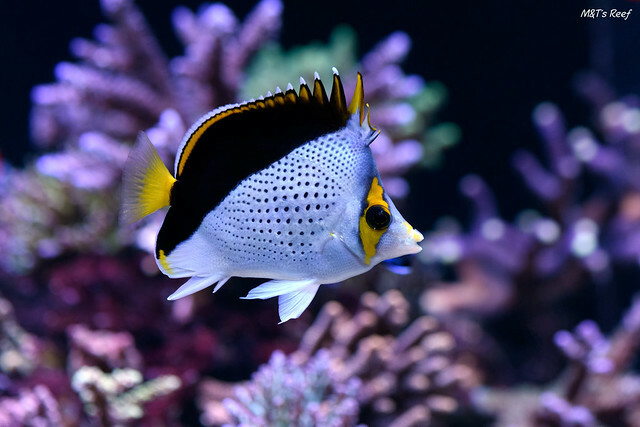 This means that it typically transitions quite easily to consuming most foods offered in the captive environment such as brine shrimp, mysis and marine plankton. In our busy 300g reef aquarium, the Tinker’s competes quite well with the most aggressive of eaters and always gets his fare share! Caution should be exercised when introducing this species to a reef aquarium, especially with soft corals and fleshy LPS. We have found in our SPS dominated reef that they (along with our C. loricula, and P. diacanthus) do tend to taste-test new corals and may occasionally nip at SPS polyps, but do not do any real damage. It should be noted that this occasional nipping, while harmless, does result in less SPS polyp extension during the day. We also keep a few LPS (chalices and Blastomussa merletti) which they tend to ignore. While C. tinkeri does command a high price due to difficulty in collection, it is a hardy species that acclimates easily to captivity. 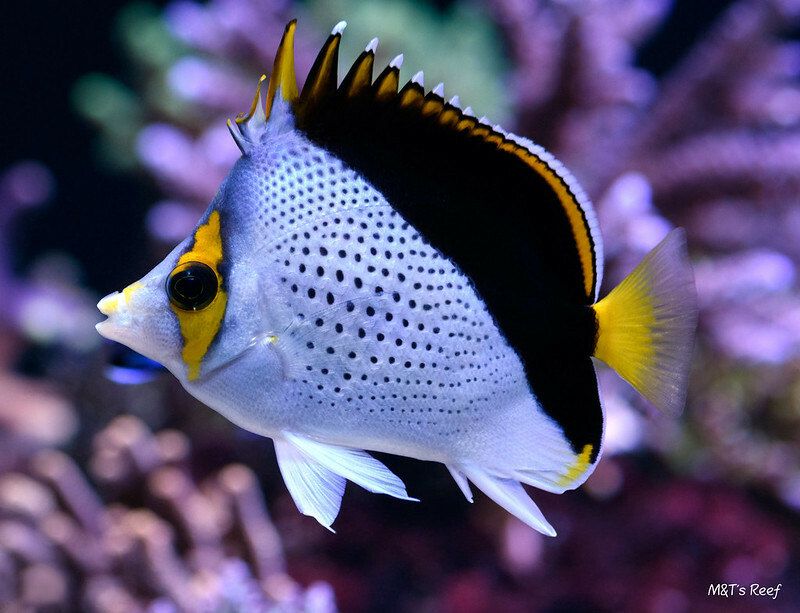 This hardiness, coupled with its bold and curious nature make the Tinker’s Butterflyfish an excellent addition to a fish only aquarium. And for the aquarist who is willing to take a little risk, it can also make a wonderful addition to their reef. Terry and her husband, Mike, have kept marine aquariums since 1984. Their current system is a 300g SPS dominated reef that is home to a large variety of reef safe fish. They are active members in their local reefing community, members of MASNA and moderators at Reef2Reef. Their freelance writing and photographs have been published in several online and print publications.